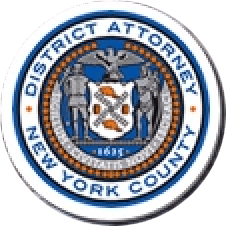 Manhattan District Attorney Cyrus R. Vance, Jr., today announced the sentencing of DERRICK WHITE, 35, to 18 years-to-life in state prison for firing multiple gunshots on an East Harlem street corner, injuring a 31-year-old victim and striking the side of an MTA bus. On June 8, 2016, a New York Supreme Court jury found the defendant guilty of two counts of Criminal Possession of a Weapon in the Second Degree and one count each of Assault in the Second Degree and Reckless Endangerment in the First Degree. As proven at trial, at approximately 5:10 p.m. on April 20, 2015, WHITE was standing on the east side of Madison Avenue between East 103rd and East 104th Streets when he fired at least three gun shots at the victim — one of which struck the victim’s foot. Two other bullets hit an MTA bus traveling northbound on Madison Avenue, striking a panel on the bus’s exterior and a window on the passenger side. The bullets did not strike the passengers or driver of the bus. The defendant immediately fled to a residential building on East 104th Street. NYPD responded to a 911 call and identified WHITE, a violent predicate felon, as a suspect after reviewing video surveillance footage. The defendant was apprehended two days later on April 22, 2015. Assistant District Attorneys Michele Bayer, Deputy Chief of Trial Bureau 60, and Justin Tatham handled the prosecution of the case under the supervision of Assistant District Attorney Charles Whitt, Chief of Trial Bureau 60, and Executive Assistant District Attorneys David O’Keefe, Deputy Chief of the Trial Division, and John Irwin, Chief of the Trial Division. Assistant District Attorneys William Mahoney, Counsel to the Conviction Integrity Unit, and Yuval Simchi-Levi also assisted with the prosecution of the case. District Attorney Vance also thanked Investigator John D’Alessio of the Manhattan DA Squad and the following members of the NYPD for their assistance with the investigation: Detective Leonardo Moscoso of the 20th Precinct Detective Squad; Detectives Facelis Turner and William Dunn of the 23rd Precinct Detective Squad; and Officers Matthew Vantress and Jonathan Perez of the 23rd Precinct.